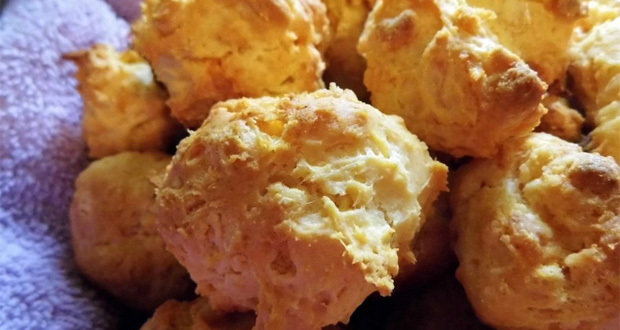 These low carb biscuits have a mere 4 net carbs per serving. The are cheesy and moist thanks to the addition of the 2 tablespoons of mayo. Make sure you stick to regular mayo as the low fat varieties increase the carbs and sodium. If you are more of a sweet tooth, try adding fresh fruit instead of cheese and drizzle cooled biscuits with melted dark chocolate. Whisk both flours, baking powder, garlic powder and salt together. Whisk in the 1/2 cup of cheese stir in eggs, sour cream, melted butter and mayo. Drop rounded spoonful's on prepared baking sheets and top each one with a bit more grated cheese. Bake 20-23 minutes til firm to touch. Cool 5 min.